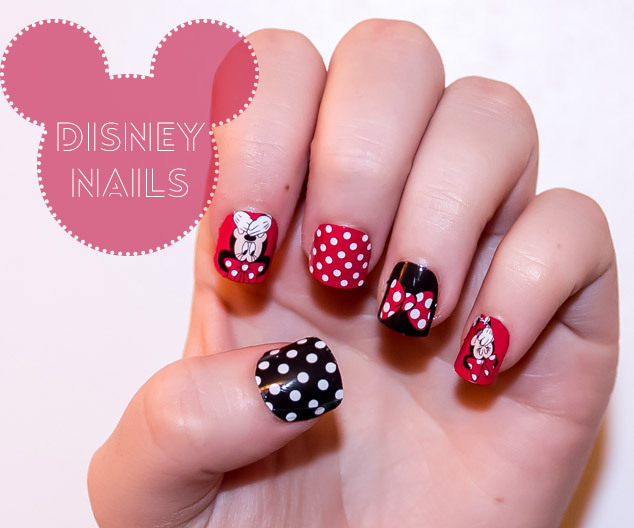 I love nail art designs and Minnie Mouse so when I saw these nail stickers in Poundland I knew I had to give them a go. I’ve found them on Ebay too at a good price if you cannot find them in your local Poundland, but I’d recommend looking their first for nail stickers. They often seem to stock branded nail polishes, stickers and art tools as well as makeup with fantastic discounts. If you don’t have a steady hand but like having quirky nails, nail stickers are a brilliant way to brighten up your nails. They are easy to apply and can last a long time with a good top coat. There are so many designs about now that you aren’t limited by choice. I used false nails for this design so that I could easily do my right hand as well and have longer nails. To use the stickers look at the size that is right for each nail. Make sure that your nails are clean, dry and free from polish. Peel off the sticker, trim the end slightly if needed and press down onto the nail. Trim the excess and use a file to neaten off. Use a hairdryer to heat up the nail stickers to make them stick that bit better. Leave to cool down and stick to the nail and then apply a generous amount of top coat, possibly even 2 coats if you think it needs it. I’ve had good results from branded nail stickers as well as £1 Primark nail stickers just by using a really good topcoat to seal them on. Make sure any bumps are smoothed out before applying the top coat.